We are so excited to be able to share our upcoming Wedding with you at Ocean Riviera Paradise in gorgeous Playa del Carmen, Mexico. Your presence means the world to us as we have the time of our lives and pledge our love to each other in paradise. Cheryl & Shea Bailey, of Yellow Umbrella Travel, a destination wedding travel agency, has been amazing with helping us with all the booking details. They have worked with the hotel to secure a group rate with the resort and to help all of our guests book their travel accommodations for our wedding on June 15th, 2018. The Ocean Riviera Paradise is a new five-star resort located on the seafront in the Playa del Carmen area of the Riviera Maya about 55 minutes from the Cancun International Airport. The resort is noteworthy for its size and the extensive selection of services it offers. It boasts spectacular swimming pools, exclusive Junior Suites, a wide range of cuisine, a Despacio Spa Center, Privilege, Exclusive Rooms and Services, a Dive It! diving centro and a great choice of entertainment for the whole family. Daisy: for families with children. Privilege: an exclusive section with VIP services. Edén: an area closer to the beach with rooms that have direct access to a swimming pool. El Beso: an area for over-18s. The areas you have already selected to stay in are the Daisy and Eden. **As of October 1st, 2018, the Municipality of Solidaridad will be charging an Eco Tax of 20.00 Mexico Pesos (approx. $1.10 USD) per room per night. This amount is not included in your vacation price and will be collected at your hotel. These funds are being used to protect, maintain and conserve the natural beauty of the destination the area and its surroundings. ***These rates do not include airfare. You are responsible for reserving your own flights. When you fill out the Reservation Form you can select the room category you have already confirmed with Graciela. A $50.00 per person deposit is required to make your reservation and is due by October 25th, 2017. Full payment of you trip is due by March 21st, 2018. There is a 3 night minimum when making your reservation but you are welcome to extend your stay or upgrade to a higher room category. The room block is from June 13th – 20th but you can arrive at any time within those dates. Just remember, the wedding ceremony is on June 15th at 5pm so make for sure you arrive before then. 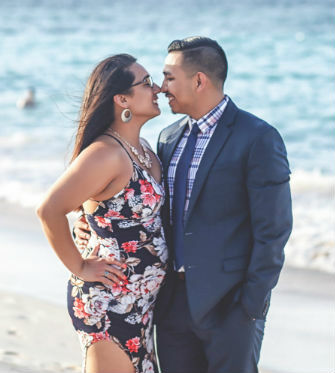 To be considered part of Graciela & Juan’s Wedding Group, you must book through the group rates and not through any other method (even directly with the hotel). We have negotiated competitive group rates and secured a room block to make this as easy as possible. To participate in all of the wedding-related activities, you must stay at Ocean Riviera Paradise as part of the wedding group. A deposit in the amount of $50.00 per person/per room is required by October 25th, 2017, to reserve your room and book your stay. The deadline for the balance to be paid in full is March 21st, 2018. You may make any additional payments at any time up to the balance due date of March 21st, 2018.